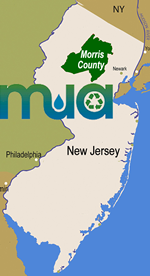 The MCMUA maintains a listing of solid waste facilities that manage specific materials for disposal and/or recycling. Please use this listing to locate a facility that serves your waste management needs. Note that not all facilities are located in Morris County. Being listed on the MCMUA's website does not provide an MCMUA endorsement of any facility, nor can the MCMUA insure that any solid waste facility is currently permitted and/or approved to accept such a material. Contact facilities prior to delivering waste to verify what materials they can accept and if there are any restrictions associated with such delivery of materials.